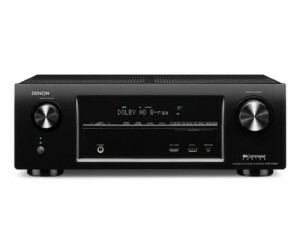 Did you know the sound of tunes and stereo is great from the Denon AVR-X1000 Home Theater AV Receiver with AirPlay? This home theater system that provides an impressive level of sound and an impressive 6HDMI inputs can give you all the crisp and clear sound you need. With its sleek finish and the ability to let you enjoy music anywhere in your home, you can’t go wrong with this system. This AV receiver that may slightly resemble an older stereo system has an impressive set of control options. Not only can you control the sound via the front panel and the remote control, but there’s also the option for you to control it via your smartphone or even your tablet too. This means you have a lot more flexibility, and it won’t matter so much if you misplace the remote control for a while. Simply download the app and pair it with your new receiver, you should then be able to select from a wide range of options, giving you the chance to control the sound if you’re nearby. One of the good things about this receiver is that it’s fairly easy to set up. There are no complicated instructions for you to follow. The on screen display will guide you through the set up process and enable you to get your speakers connected and positioned correctly so you can enjoy optimum sound quality. What’s more is you’ll also find the color coded cables and labels so much easier to use. This means you will soon be able to enjoy a better quality of sound, a lot sooner than you think. Sometimes we want to listen to or watch something different from the rest of the household. This system will let you do that with relative ease. Whether you usually listen to or watch things through wireless speakers or an old stereo, you can vastly improve the quality of sound pretty easily. Simply use the two source multi-room option that will allow you to connect a stereo amplifier to the zone 2 pre-out. This will enable you to listen to music or watch television in a different room, through another audio or visual source. A lot of devices are big and bulky, but this particular home theater receiver is different. Although its look may remind you somewhat of an old boombox from the 1980’s, it is in fact quite a bit slimmer. Because comes with just 13 inches of depth, you can be sure that it will not take up too much room. This is likely to make it a lot easier to install, and fit in your home. Chances are it’s likely to fit on shelving and television cabinets a little easier than some models might. It’s always worth your while measuring up your current shelves before you buy a new receiver, just to make sure that it does fit. We all like to connect our devices up to each other, and this can be done pretty easily thanks to the large number of HDMI inputs you will find on this receiver. 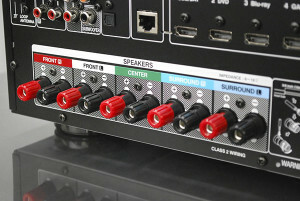 With an impressive 6 inputs, one on the front panel and five at the rear, you can connect many devices. Attach your games console, your television, how about your camcorder or any other device that is HDMI enabled. Enjoy better sound and picture quality every single time, and don’t forget to select the right AV options so the sound can be improved further. 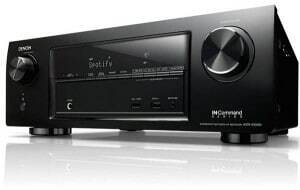 This good looking home theater receiver comes with a handy USB port, which makes connection even easier. Sometimes it can be difficult to charge your cell phone or other device. It’s good news then that you can simply attach your cell phone, iPad, iPod or other device to the receiver and it will charge it for you. But that’s not all that it will do, you can also enjoy playing back music from your devices too, which means you can enjoy it through some larger speakers for a change.